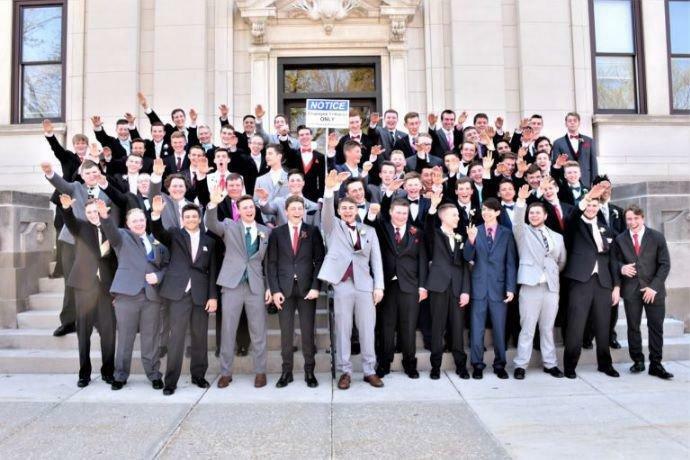 Wisconsin Police "Investigating" Photo of High School Class "Seig Heil," Where Is The Crime? The assault on free speech rages as the Baraboo, Wisconsin Police Department has announced that they're “investigating” a photograph of a White high school class giving a “Sieg Heil,” which went viral on social media. While some are quick to condemn the photograph as being <i>tasteless</i>, we're left to ask what crime these upstanding and law-abiding citizens are guilty of committing? The basis for the claims of an “investigation” by the Baraboo Police Department is mind-boggling, as it lacks any legal justification. Police are now officially “investigating” non-crimes in America. The crime here would be that someone is sharing photographs of underage children without their parent's consent. But it's not as if they're dog-whistling for Antifa violence, committing slanderous libel against these fragile young people's lives, right? This liberal hypocrisy is beyond infringing upon the rights of Americans, and they're expecting the public to respond with condemnation of these children. We've seen similar behavior against the administrative staff of educational facilities. In Connecticut, Assistant professor of business and economics Charles Meyrick at Housatonic Community College was said to have held his right arm in a Nazi Salute, resulting in his suspension. There's nothing illegal about giving a “Seig Heil,” regardless of <i>who</i> it offends. Where do we draw the lines? A group of “teens” shouting Black Lives Matter burn down an entire inner city block, and nobody bats an eye. A group of White kids gives a harmless salute in a photograph, and the world loses its mind. Those lines are already drawn. It's called freedom of speech. I wonder if a black man raising his fist in the air is sign of black nationalists like those South Africa. Wait, how about the communist group ANC? RACIST BASTARDS! Xenophobic misogynistic black people? Tell me it isn’t possible. it's the liberals who are fascists. whodathunkit?